Compressor loaded Expanders with oil lubricated bearings. The expander and compressor wheels are mounted on a common shaft and the energy recovered from the expansion powers the compressor wheel, which can be used as a booster compressor. 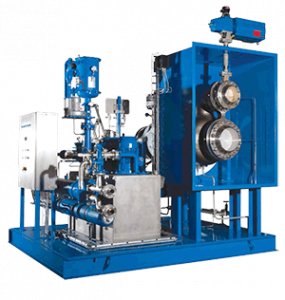 A double or triple shaft seal arrangement ensures no lube-oil leakage to the atmosphere or the process gas. The TC is available in 6 frame sizes with a power range from 50 to 12’000 kW. Design is customized to fulfill customers’ requirements in terms of standards : API standards, local standards or customers’ best practice standards can be applied when requested.